A newly found fossil meteorite is of a kind different than any ever found, suggesting it may come from a parent asteroid consumed by collisions whose fragments no longer fall to Earth. A newly uncovered meteorite may be the first-ever "extinct" meteorite — a member of a class of meteorite that no longer falls to Earth. The ancient rock may yield insights on a cosmic impact that created most of the meteorites that now crash on Earth, and which may have influenced the evolution of life on Earth, researchers said. The most common kind of ordinary chondrite is known as the L-type, which makes up about 47 percent of those rocks. Previous research on meteorites embedded in ancient marine limestone revealed that about 470 million years ago, there was an at least hundredfold rise in the number of L-type chondrites that crashed onto Earth. This suggested that the parent asteroid of all the L-type chondrites experienced a major collision with another asteroid at about that time. This cosmic impact occurred during the Ordovician Period, when major changes in Earth's marine animal diversity occurred, such as the first appearance of coral reefs. A better understanding of this extraterrestrial collision could shed light on astronomical disturbances that might have influenced Earth, said study lead author Birger Schmitz, a geologist at Lund University in Sweden. "If we see that changes in the asteroid belt correlate with changes in Earth's biosphere or climate, then there is probably a connection and we will be able to better tie Earth's history to the history of the solar system," Schmitz told Space.com. "Earth scientists have for the past 200 years had a tendency to look on Earth as a closed system, but the discovery of the asteroid impact that killed off the dinosaurs 65 million years ago made at least some earth scientists understand that the history of life and Earth is connected to the astronomical realm." Now researchers say they may have discovered a meteorite that is a remnant of the asteroid that smashed into the parent of the L-type chondrites. "The single meteorite that we found on the Ordovician seafloor is of a type that we do not know of from today's world," Schmitz told Space.com. "This hints that the types of meteorites that fell on Earth in the ancient past were very different than those falling today." More than 100 fossil meteorites embedded in marine limestone have been found in Sweden's Thorsberg quarry. The meteorites fell to Earth around 470 million years ago after asteroids smashed into one another. The newfound meteorite is a rock about 3.15 inches (8 centimeters) long that is about 470 million years old. It was unearthed in Thorsberg quarry near the Swedish village Österplana alongside more than 100 L-type chondrites of similar age. The meteorite possesses grains of crystals known as spinels that are very different from those found in all other known meteorites. Further analysis of the strange meteorite found that its ratio of chromium to oxygen isotopes is unlike any seen from known meteorite types. "For a long time we called the meteorite the 'Mysterious Object' because we could not understand what it was," Schmitz said. Schmitz and his colleagues measured how long the newfound meteorite had been exposed to cosmic rays, a dating technique called cosmic ray exposure, and they found that the impacts that gave birth to the meteorite, now named Österplana, or Öst 65, and to the L-type chondrites found with Öst 65 both occurred about 1 million years before all these meteorites crashed on Earth. This suggests that the impact that formed Öst 65 was the same one that destroyed the parent of the L-type chondrites, the scientists said. The researchers said the parent asteroid of Öst 65 may have been almost destroyed during its collision with the progenitor of the L-type chondrites, which could explain why this kind of meteorite was previously not discovered on Earth. "This is the first documented example of an extinct meteorite — that is, a type of meteorite that no longer falls on Earth today," Schmitz said. "We knew of extinct animals, and it has been speculated that there is something like extinct meteorites, but this is the first one found." The findings suggest that the meteorites largely found on Earth today may not give a full picture of the kinds of bodies in the asteroid belt more than 500 million years ago, or in the nebula cloud of gas and dust that gave birth to the solar system about 4.6 billion years ago. 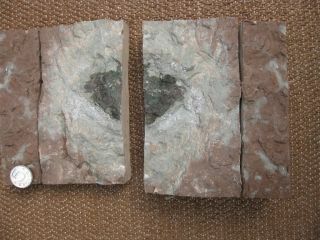 "We base our view of how the solar system formed and evolved on the meteorites that fall on Earth today," Schmitz said. "If these meteorites are not representative of what has been falling on Earth in the past, we have to take that into consideration when reconstructing how the original nebula condensed into solid planets and asteroids." Future research may discover other classes of extinct meteorites, the researchers said. The scientists detailed their findings online today (June 14) in the journal Nature Communications.